Dove Canyon is a private residential community located in eastern Rancho Santa Margarita. It is a small enclave of approximately 1,200 homes and 5,000 residents. Included within the guard-gated entry is a Jack Nicklaus signature golf club, pool, tennis courts, a small child's park, a wide field, a shopping center (just outside the entry), and a reservoir. 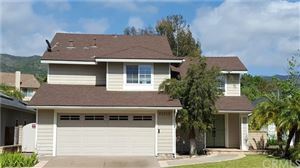 The majority of its residents are upper middle class residents of Orange County, and all of the homes in Dove Canyon are single-family residences. It is located in the Southeasternmost foothills of Orange County. Major roads include Dove Canyon/Bell Canyon and Sycamore Canyon. A horse trail starts at the waterfalls outside of the community and continues until the end of Sycamore Canyon. From there, hikers, horse riders, bikers, etc. can continue into Dove Canyon's neighboring community, Coto de Caza. Clck here for more general information on Dove Canyon and Rancho Santa Margarita.